I came across this recipe while I was reading Sarah Wilson’s fantastic new book, Simplicious. I had seen it in an old Vegiehead YouTube video too, and always meant to give it a go. I decided it was time, and I was not disappointed! This healthy lunch takes 5 minutes to prepare in the morning or the night before. finely grated carrot, or other veggies you may have in the fridge. I added leftover beetroot coleslaw mix. 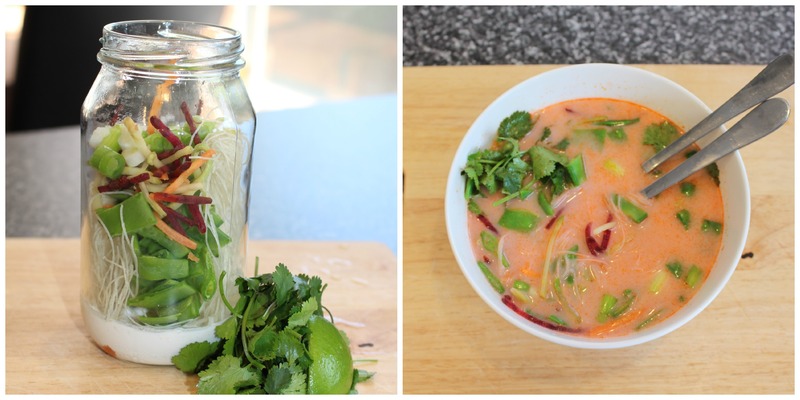 Place all of the ingredients (except the coriander and lime) in a glass jar. Keep it in the fridge when you arrive at work. At lunch time, fill the jar with boiling water, cover and leave for 2 minutes, stirring once or twice. Top with the coriander and a squeeze of lime juice. Ideally you would make this in a jar with a wider mouth (like the one Vegiehead uses in the video above) so that you can eat it straight from the jar. Otherwise you can to pour it into a bowl to eat like I did.